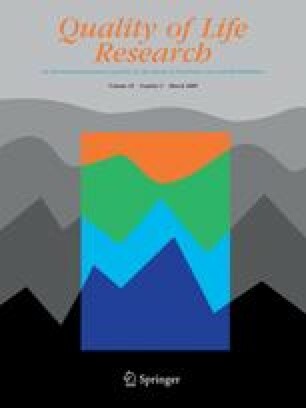 The purpose of this analysis was to determine the unique contribution of household income to the variance explained in psychological well-being (PWB) among a sample of colorectal cancer (CRC) survivors. This study is a secondary analysis of data collected as part of the Health-Related Quality of Life in Long-Term Colorectal Cancer Survivors Study, which included CRC survivors with (cases) and without (controls) ostomies. The dataset included socio-demographic, health status, and health-related quality of life (HRQOL) information. HRQOL was assessed with the modified City of Hope Quality of Life (mCOH-QOL)-Ostomy questionnaire and SF-36v2. To assess the relationship between income and PWB, a hierarchical linear regression model was constructed combining data from both cases and controls. After accounting for the proportion of variance in PWB explained by the other independent variables in the model, the additional variance explained by income was significant (R 2 increased from 0.228 to 0.250; P = 0.006). Although the study design does not allow causal inference, these results demonstrate a significant relationship between income and PWB in CRC survivors. The findings suggest that for non-randomized group comparisons of HRQOL, income should, at the very least, be included as a control variable in the analysis. The data used for this research were collected as part of a study conducted by the Southern Arizona Veterans Affairs Health Care System (SAVAHCS)/Kaiser Permanente Collaborative Research Group, which was made possible by grant no. R01 CA106912 from the National Cancer Institute in collaboration with resources and the use of facilities provided at the Southern Arizona Veterans Affairs Health Care System, Tucson, Arizona. Additional support was provided through the Arizona Cancer Center Support Grant CA023074 and by the College of Pharmacy at the University of Arizona. The views expressed in this article are those of the authors and do not necessarily represent the views of Kaiser Permanente, the Department of Veterans Affairs, or the University of Arizona. May, J. H., & Cunningham, P. J. (2004). Tough trade-offs: Medical bills, family finances and access to care. Issue Brief (Center for Studying Health System Change), 1–4. Available at http://www.hschange.com/CONTENT/689/. Accessed 28 Dec 2008. Pachler, J., & Wille-Jørgensen, P. (2005). Quality of life after rectal resection for cancer, with or without permanent colostomy. The Cochrane Database of Systematic Reviews, (2). doi: 10.1002/14651858.CD004323.pub3. (The Cochrane Database of Systematic Reviews 2004; (3):CD004323.pub3).